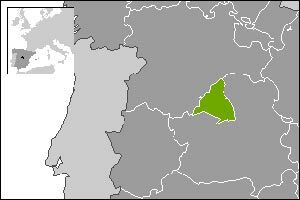 The Autonomous Community of Madrid (Spanish: Comunidad de Madrid) is one of Spain's seventeen autonomous communities, located in the centre of the country. It is coterminous with the province of Madrid, and contains the city of Madrid, which is the capital of the community, the province, and the country. The Community is bordered by the autonomous communities of Castile-Leon (provinces of Ávila and Segovia) and Castile-La Mancha (provinces of Guadalajara, Cuenca, and Toledo). Over half of the population live in the capital. Other historically or commercially important cities located in the community include Alcalá de Henares, Coslada, Torrejón de Ardoz, Getafe, Móstoles, San Lorenzo de El Escorial, Navalcarnero and Aranjuez. There are 179 municipalities in Madrid.